Exploring the early CD catalog of the independent English label Hyperion. This program was recorded in August 1983, originally published on LP A66104 in 1984 and CD-reissued in 1991 (review in The Gramophone of November). Erudite and fascinating liner notes, about the turn from 18th-century rationalism to romanticism and the fad for druidism in late 18th century Great Britain and Ireland, and the rediscovery of the folksong heritage of the British Islands, giving the cultural background and sources of Haydn’s Welsh folksongs arrangements, made at the behest of Scottish folksong collector and publisher George Thomson (1757-1851). 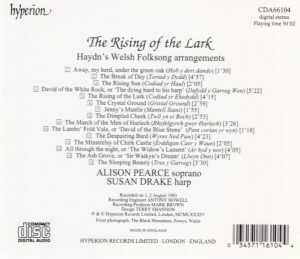 The notes however are not entirely clear about what it is precisely that soprano Alison Pearce and harpist Susan Drake play, but the information provided in the notes can be complemented with a thorough research paper by Marjorie E. Rycroft, available online, “Haydn’s Welsh songs: George Thomson’s musical and literary sources” (link will open new tab to article in .pdf form) published by the University of Glasgow in the “Welsh Music History” journal vol. 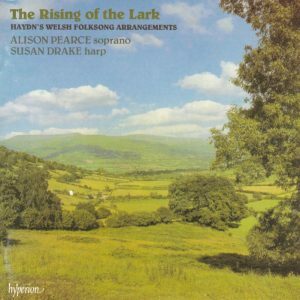 7 (2008), written in the wake of the publication in 2004 by Henle of an Urtext edition of Haydn’s Welsh folksongs (of which she was the editor). According to Rycroft, Haydn wrote in all 214 folksong arrangements for Thomson, a collaboration begun in 1791, including sixty on Welsh tunes, written (some or all, apparently, with the assistance of his pupil Sigismund von Neukomm) in 1803 and 1804. The latter are among Haydn’s last works. Not all those written by Haydn were published by Thomson: he withheld 19 among Haydn’s sixty (in some cases he preferred the alternative arrangements by Kozeluch). They bear the numbers XXXIb:1-60 in Anthony Hoboken’s catalog of Haydn’s works. 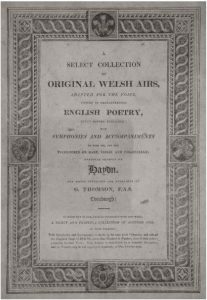 Thomson’s first volume of Welsh songs was published in 1809, two others followed in 1811 and 1813, the latter with a few pieces by Haydn but most by Beethoven. In his earlier publications of Scottish and Irish folksongs, Thomson had always drawn principally on previously published sources (as the collection “Orpheus Caledonius”, 1733), with the aim of popularizing them by making them more suitable to modern tastes and for performance in the drawing room. To that end he commissioned new lyrics – at first, in the Scottish folksongs, principally from Scottish poet Robert Burns (link will open new tab to Wikipedia’s article) – and, independently, new harmonizations from composition luminaries of the day, Ignaz Pleyel, Leopold Kozeluch, Haydn and Beethoven. Likewise in the Welsh songs. All the songs played here, drawn from Thomson’s first two volumes of Welsh songs, originated as harp tunes previously published first in 1784 by the Welsh harper Edward Jones (1752-1824), “Musical and Poetical Relicks of the Welsh Bards… (with) a General History of the Bards and Druids” (link to Archive.org), purported to be of ancient origin but in reality a corrupt mixture of that and 17th century country dances. In Jones’ original publication, the scores themselves begin .pdf page 133, which means that the historical and musicological introduction makes up more than 100 pages. So the real precursor of “ethno-musicology” here was Jones rather than Thomson. Add to that that, as Rycroft points out, Thomson was concerned by “musical pleasure” and easy singability more than by authenticity. Oftentimes what he sent to Haydn to harmonize were heavily doctored versions of the original melodies. In some cases he asked Haydn to arrange them for duets. That said, Rycroft insists on the “meticulous care and attention devoted by Thomson to his Scottish, Welsh and Irish Collections”, and shows that he went far beyond just borrowing from Jones, and that “for his Welsh Collection he undertook extensive research into everything Welsh”. He also asked his lyricists to include, as much as possible, Welsh “names or localities” in their verses. According to Rycroft, Haydn’s arrangements were written for piano forte, violin and cello : giving the harp as alternative was Thomson’s decision. For a while he had even considered commissioning and publishing alternative versions for voice and harp, before dropping the idea in view of the limited commercial prospects of such arrangements. Only a few remain, in the form of alternative versions to Haydn’s, by Kozeluch. Ultimately, then, Haydn’s arrangements aren’t really settings of the lyrics, although they were published as such, but rather harmonizations (with introductions and codas) of the tunes. It would be more “authentic”, at least to Haydn, to play versions for trio of piano, violin and cello (and since the Urtext publication of his folksongs, recordings in that form have been cropping up). All those Haydn arrangements were later republished by Thomson in a new collection gathering the Scottish, Irish and Welsh folksong arrangements commissioned by Thomson from Haydn, Pleyel, Kozeluch and Beethoven, in five volumes, with the title “Select Melodies of Scotland, interspersed with those of Ireland and Wales”, four of which (1, 2, 3, 5) can be found on IMSLP, but now with accompaniment limited to “piano forte”. All these were again later republished (again with accompaniment limited to piano forte) in a six-volume collection, “Thomson’s Collection of the Songs of Burns, Sir Walter Scott Bart and other eminent lyric poets ancient and modern”, of which vols. 1, 3, 4 and 6 are hosted by IMSLP (here is the link to the index on IMSLP). Comparison shows that vols. 1 and 3 of both publications have the same contents. 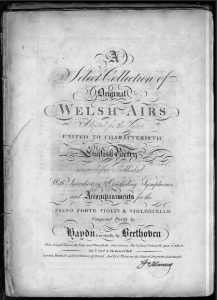 Without access to Thomson’s original publication of Haydn’s Welsh songs I don’t know for sure, but I assume that these piano forte arrangements are simply the original parts (for piano forte or harp) with the violin and cello parts left out. I’ve checked on one of Beethoven’s Welsh songs from vol. 3 of the original collection, republished in vol. 5 of “Select Melodies”, “Gogerddan”, and it is the case. Looking through the six volumes, I haven’t found all the Haydn Welsh songs performed by Alison Pearce and Susan Drake, so I infer that Thomson’s collections didn’t gather all of Haydn’s Welsh songs. David of the White Rock, or “The dying bard to his harp” (4) = vol. 1-49 The Dying Bard – David of the White Rock, but to different lyrics, by Walter Scott in the score, vs Rev. George Warrington on the CD. In her essay Rycroft also attributes the lyrics to Warrington, and doesn’t mention the lyrics by Walter Scott. I suppose that Thomson substituted one poet/poem for the other in his republication. So, in all, the arrangements played by the Hyperion team are both “inauthentic” and “authentic”. By using an accompaniment limited to the harp (rather than piano forte), they are neither fish nor fowl, not exactly what Haydn wrote, not exactly what Thomson published or re-published under Haydn’s name. More is even lost in the song “David of the White Rock, or The dying bard to his harp” (track 4) where, probably upon request of Thomson, Haydn had written the violin and cello parts in pizzicati in imitation, precisely, of the harp – an imitation effect evidently lost when the song is accompanied by harp. And Thomson’s publications, with their modern poetry added to the harmonizations of often corrupt tunes, are all but authentic themselves, in the modern “ethno-musicological” sense. But, with all that said, there is a legitimacy to singing them with an accompaniment limited to harp: they do return, in a way, to the pseudo-“bardic” authenticity of Edward Jones’ publications – it is the authenticity of “Ossian”, if you like: not authentic bard, but authentically the pre-romantic fantasy of what bards may have been. Anyway, and in the end, I am aware that these “ethno-musicological” considerations are way too heavy (and the time I spent on researching these matters way too long) for the simple pleasures that Pearce’s and Drake’s recital have to offer – which was precisely the aim of Thomson. The works are simple – expect “folksongs” rather than “Haydn’. There is nothing particularly Haydnesque to them. Alison Pearce has a pretty soprano voice, the music is pretty and sweet – maybe a little to uniformly sweet to offer true substance. Text of songs provided, TT 55 minutes.